Pavtube CUDA FLV Converter now can convert all encoded FLV/F4V videos to other video formats like MOV, MP4, MKV, WMV, AVI, DVD, VCD, SVCD, FLV (Sorenson H.263), FLV (H.264), SWF etc with ease. When surfing the Internet, you maybe encounter funny videos from time to time on the video sharing sites, such as YouTube, Hulu, Music, MySpace, Metacafe, Google Video, iFilm, Dailymotion, etc. And you will find that the videos posted on these public sites are all in the FLV file format, even in the F4V format, since the FLV is a proprietary file format for publishing and sharing videos online due to its high rates of compression, facilitating online delivery. On the other hand, because of the ubiquity of Adobe Flash Player, the FLV file format has becoming more and more popular. Here the tutorial will to show you a good way to convert FLV to DVD format via CUDA support tool - Pavtube FLV Converter. Preparation: Free download the Pavtube FLV to DVD Converter here, and install it. Click “Add” to load your source FLV file into this FLV to DVD Converter. Click “Edit” to open the editor panel. Here you can do some more advanced editing according to personal tastes. The video can be cropped regarding individual needs. You can also reduce the play duration by the “Trim” function. In addition, you will have a nice surprise by the functions of adding logo and text, because only when you check “Image/video watermark”, you can add image or video by browsing files in the red pane. Check “Text watermark” alike to present your own ideas. Click “Settings” to open the profile window, you could choose output format, and set the video and audio paramaters to get better qualtiy. PS: The Frame Size of the DVD file format has been pre-configured by the program to meet different needs. Check “Convert” and click “Start“, mission of FLV to DVD conversion will be accomplished soon. Then, you can get the converted DVD files and put them on your DVD player for enjoyment. What funny! DVD stands for Digital Versatile Disc. It is very often used as a replacement acronym for DVD-Video, which is one standard based on DVD format. Generally, DVD incorporates the divisions of DVD-Video and DVD-Audio. DVD-Video is a standard developed by the DVD Forum, an authority behind various DVD standards, and specifies how video should be stored on optical DVD disc. 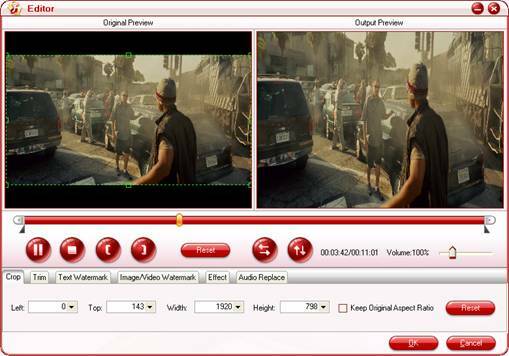 DVD-Video specifications allow for two different kinds of video encoding algorithms: MPEG-2 and MPEG-1. Almost all DVD-Video discs use MPEG-2 format, mostly because of its superiority over MPEG-1 in terms of video quality. DVD-Audio is music disc, aimed to replace regular audio CD within next few years. Convert FLV to AVI video with DIVX codec to author a desired video with your favorite FLV movie! How to play flv offline? How to create FLV Player playlist? How to Convert Youtube Video FLV to WMV for Playback on your Creative Zen?